Take me to the worksheets now! These worksheets and all related files are licensed under the Creative Commons Attribution License, version 1.0. To view a copy of this license, visit http://creativecommons.org/licenses/by/1.0/ or send a letter to Creative Commons, 559 Nathan Abbott Way, Stanford, California 94305, USA. The terms and conditions of this license allow for free copying, distribution, and/or modification of all licensed works by the general public. The purpose of this website is to provide both rationale and resources for research/discussion-based instruction to instructors everywhere. Central to the Socratic Electronics project is a large collection of questions and answers, intended as student assignments. By requiring students to research answers to these questions, then present their findings in class, students learn how to locate information, problem-solve, collaborate, and clearly articulate their thoughts while learning the basic subject matter. While the resources provided on this site are specifically designed for teaching electronics, the method itself is applicable to a wide variety of disciplines. I welcome constructive criticism, as well as participation in the development of this learning resource. For those interested in the genesis and application of this teaching philosophy, here is a ``manifesto'' I've written on the subject of learning to learn. It briefly chronicles my experiences with this learning method during the first year of its application in my class. A new exhibit has been added to the Topical Worksheets page: a section containing animations to help describe dynamic processes in electric and electronic circuits. Scroll to the bottom of the page to see what's there! 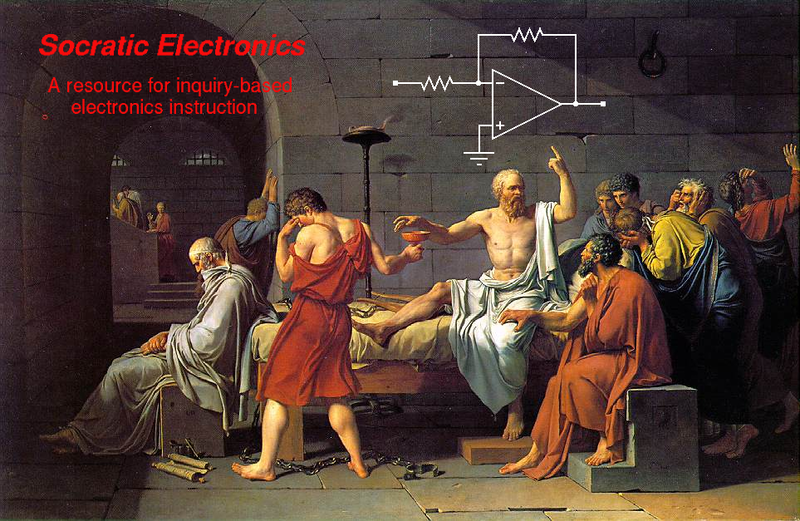 As of January 1, 2006 there are now over 3800 questions in the Socratic Electronics project database! To read more about contributions to this project, click here. How do I use these worksheets in my own classroom? How do I not use these worksheets in my own classroom? Isn't this just programmed instruction? Is there only one proper way to teach using these worksheets? Describe some of the alternative classroom formats possible when teaching with these worksheets. How applicable is this teaching method to other subjects? What benefits have you noticed from teaching this way instead of lecturing? What dangers are there to teaching this way instead of lecturing? What do students think of learning this way? What about students who learn better in a lecture environment? Why not just use questions provided in textbooks, instead of these worksheets? What does a typical ``question'' file look like? Why are answers provided for the worksheet questions? How should good worksheet questions be written? How do I find a question file for a particular topic among all the questions that have already been written? How do I create graphic images for making my own ``question'' files? Why did you use the Creative Commons ``Attribution'' License? Can you offer any study tips for student success? I am a student. What can I do to maximize my learning? According to the NTL, this pyramid was developed as part of a study during the 1960's. 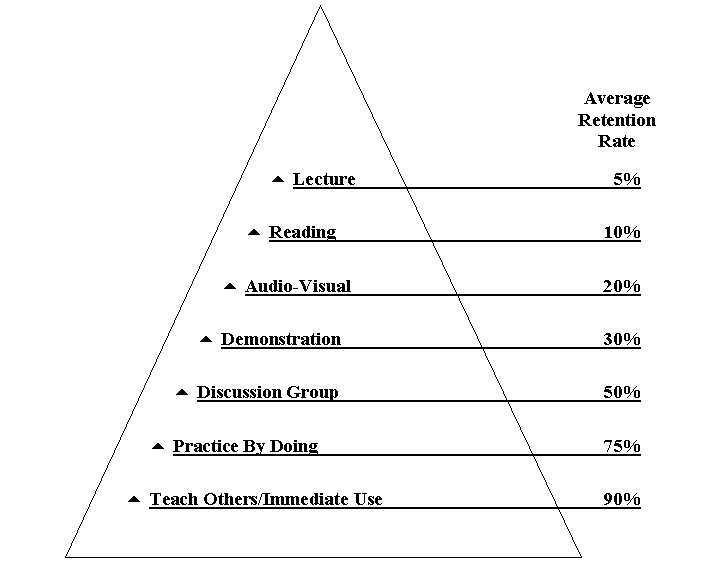 It amazed me that I never saw this ``pyramid'' during my own educational philosophy classes. Of course, I saw the one contrasting the different sensory modes (listening, reading, doing), but was never shown anything as directly critical of lecture as this. I draw a significant amount of inspiration from the writings of other educators. Here, I share with you some thoughts of fellow teachers with philosophies similar to mine. Chris Sells of Microsoft writes about his own experiences learning how to learn, while working as a trainer. Click here for a direct link to his website. The National Education Association produces a professional journal called Thought and Action. Over the years, this journal has presented several outstanding essays on educational reform. I present links to some of them here (note: all articles are in Adobe PDF format). And now, for something completely different . . . the humorous/satirical/wise quote of the month. Here, I present tidbits of wisdom from wherever I can find, regarding education and instructional philosophy. Some of it straightforward, some of it satirical, a lot of it funny. In case you happen to read one of the humorous quotes and don't get it, take it as a sign of purity -- that you have managed to escape from school with your innocence unscathed. Topical worksheets (short worksheets focused on individual topics). For those of you who don't want to go through the trouble of ``compiling'' your own custom worksheets, you may simply download as many topical worksheets as you need and teach with those. Worksheet covering one week of instruction in an AC course that I teach: [PDF] Note how a daily schedule is incorporated on the first page, and a list of skill standards on the second page, prior to any of the questions. This is the technically easiest option for you if you wish to download all completed worksheets in one step, rather than select them individually from the list of topics. Copy the file work_pdf.tar.gz to the directory on your hard drive where you wish to have the Socratic Electronics worksheets located. I highly recommend you create a special directory for this. Use the ``gzip'' program to uncompress the archive file: gzip -d work_pdf.tar.gz, or you may use a program such as WinZip to do the same. Use the ``tar'' program to unpack the individual files: tar xvf work_pdf.tar, or you may use a program such as WinZip to do the same. All source files for the project in their entirety (uncompiled), as a single compressed file: selec.tar.gz. This is a far more compact file than either of the pre-compiled worksheet files. This project was created on a computer running the Linux operating system, where all these utilities are standard. The best advice I can give to people wanting to compile these worksheets on a Microsoft Windows machine is to download the free program named Cygwin, which provides you with a Bash command shell plus all the other necessary utilities (make, cat, sed, tex, dvips, ps2pdf) when fully installed. Copy the file selec.tar.gz to your hard drive. If you intend to compile your own worksheets from source files, it is assumed you are an experienced computer user and are capable of solving the inevitable software setup problems on your own. Please do not email me with questions on how to install the necessary software on your computer. If you experience trouble working with the source files, I recommend you simply download the precompiled worksheets instead. If you want an exact copy of all you see here at this website, this is what you need to download. Bear in mind this will be the largest download of them all (hundreds of megabytes in size)! Copy the file website.tar.gz to the directory on your hard drive where you wish to have the Socratic Electronics project located. I highly recommend you create a special directory for this. Use the ``gzip'' program to uncompress the archive file: gzip -d website.tar.gz, or you may use a program such as WinZip to do the same. Use the ``tar'' program to unpack the individual files: tar xvf website.tar, or you may use a program such as WinZip to do the same.